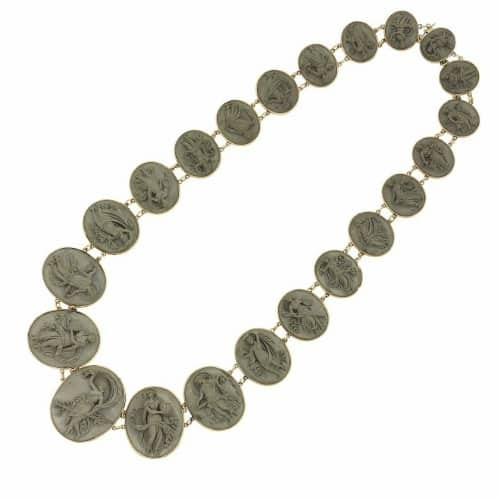 After the discovery of the buried cities of Pompeii, Herculaneum and Stabiae c. 1748, a new type of souvenir jewelry emerged. These towns had been abruptly smothered under a deadly mudflow of volcanic dust, ash, gas, and steam by the unexpected eruption of Mt. Vesuvius in 79 AD. A subsequent eruption in 1631, complete with lava, added another layer to the mix. It took almost 1700 years from the first eruption of Mt. Vesuvius for the secret of the missing cities to be revealed. Travelers on the Grand Tour of Europe found the newly excavated ruins of Pompeii to be an irresistible stop. Lava trinkets from these sites made for excellent and inexpensive souvenirs, easy to pack and carry. In addition, pinning a lava cameo on ones’ blouse proved the wearer to be a well-traveled person of culture and good taste. The local industry was equal to the demand and created many cameos and intaglios out of this unlikely material to the unending delight of the tourists. These beautiful carvings were set into rings, earrings, bracelets, and necklaces. 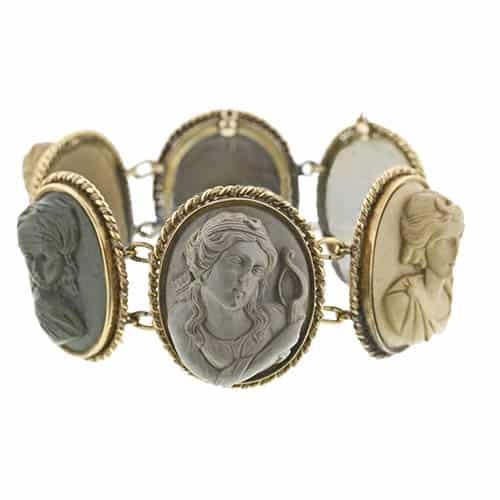 While traditionally we call these muddy-colored Italian cameos lava, technically they are more likely tuff, welded tuff or volcanic breccia which is available throughout the world. Even though it may not be geologically correct terminology, we continue to use the term lava jewelry, coined by the original Italian carvers, when referring to this material with the biscuit porcelain luster. The lava rock carvings from the Mt. Vesuvius region range in color from off-white or yellowish to varying shades of gray, when it’s not been dyed any number of deeper colors. Cameos of this type are easily identified both for the material they are carved from and the time period they were made. Subject matter included archaeological motifs, bacchantes, satyrs, portraits and mythological gods and creatures.